The FAAST™ (Fire Alarm Aspiration Sensing Technology) from System Sensor gives outstanding fire protection for enterprise-critical datacenter and IT facilities. As a global leader in the design and manufacture of fire detection devices, System Sensor has extended its technology leadership in digital communications protocols, optical chamber design, and multi-sensor fire detection to its new high-sensitivity, very early-warning aspiration fire detector, FAAST. Aspiration is the only detection technology able to detect combustion products reliably several hours before the development of a visible fire. The introduction of FAAST extends System Sensor's product range to address new applications such as IT datacenters and telecoms, where very early warning of fire is paramount. FAAST is approved to EN54-20 Class A and delivers unique technology with the highest detection performance, providing value to fire systems integrators and end users through its easy installation, setup, and commissioning. In 2006, System Sensor launched the first general-purpose hybrid aspiration system, based on its high-performance point laser detector, to address the EN54-20 Class C detection category. The ability to integrate the aspiration system into the main fire detection system provided significant efficiency savings and performance benefits in installations where aspiration is the most effective technology for protecting specific areas of the building. Although the sensitivity of the Laser-based "point detector in a box" system effectively addresses the Class C general detection requirements, it offers very limited use as a Class A system with an average coverage of around 50m2, so although it is suitable for the smallest computer rooms, it cannot be used in a large datacenter. FAAST builds on our initial experience and brings a new generation to the market, moving System Sensor into the ultra-sensitive smoke detection space for the first time. 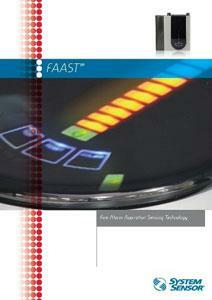 FAAST offers "best in class" sensitivity of 0.0015 percent obs/m, which allows area coverage of up to 2,000m2. FAAST is a communication-rich product, with embedded TCP/IP connectivity and an integral web server, which enables remote interrogation and management across both WAN and LAN networks, using the same backbone that is driving the hardware that the device is protecting. This is a key requirement for enterprise-critical applications, where connectivity into the system it is protecting is a fundamental requirement from datacenter managers. In addition to its network capability, FAAST interfaces with the fire control panel using the eight fire or fault relays provided in the "conventional" form. Intelligent CLIP and Advanced Protocol versions will follow in the near future. The combination of IP communication capability and connectivity into the hardware that FAAST is protecting, as well as the pure fire detection system, sets FAAST apart from others. Click on the brochure to download more information. The most important application sector for FAAST is the first category, where very high-sensitivity smoke detection is required to provide the earliest warning of a fire. Such protection is required by the end users in "Strategic Operations," where every minute of downtime costs millions in lost revenue and profit. Typical examples are IT facilities, major telecom facilities, industrial plant control rooms, banking sector computer rooms, ISP and enterprise hosting datacenters, air traffic control centres, and nuclear facilities. A commonly used metric in the datacenter world is the rule of "six nines," indicating that the installed equipment is available 99.9999 percent of the time, which is the equivalent to 0.605 seconds per week of outage. Datacenters reserve spare or redundant servers and provide uninterruptible power supplies to manage the risk of hardware failures and power outages in order to deliver expected uptime of 99.9999 percent. Such protection mechanisms must also be applied to the fire protection system, where it is essential to give very early warning of a fire to allow enough time to take any affected equipment offline and move the data to another part of the network before wider damage or loss of data is caused. The ultra-high sensitivity of an aspiration system is the only practical technology to give the warning time required in such operations; however, the technology used to deliver this very early warning in the past has been prone to false alarms. To the datacenter manager, a false alarm has the same impact as a real fire, which will often mean that power to the affected server racks is removed, so for the operator, a false alarm is as problematic as a real outbreak. Why do we care about false alarms? System Sensor technology leadership gained in other areas of fire detection has been applied to aspiration. Leadership enables us to provide additional business opportunities through extended capability and outstanding performance of FAAST devices. FAAST incorporates hardware and software technology that give the device market-leading maximum sensitivity of 0.0015 percent obs/m. At such extremely high sensitivities, differentiation between dust and combustible particles is the critical requirement in avoiding false alarms. We have incorporated several different mechanical, optical, and software features, such as the unique three-stage air filtration process to eliminate the impurities, which are the most common cause of false alarms, to ensure unrivalled performance. First filtration stage: The air sample flows through a patented wing filter, which generates a low-pressure region on its upper surface and a high-pressure region on the lower surface to eliminate particles larger than 20 microns, which are the highest contributors to false alarms. Second filtration stage: The air sample is passed through an integral filter, which acts as a safety net in preventing any particles that escaped the wing filter from entering the optical chamber. The integral filter is the only service replaceable part in the device. Airflow through the filter is monitored to create a minor fault pre-warning as it is constricted. After a 72-hour delay, a major fault warning is generated, reducing unplanned maintenance requirements. It has an expected operating life of four years, twice as long as the industry standard, with replacement without unit disassembly as a further benefit. Final filtration stage: The air sample is passed through the multi-criteria optical smoke detection chamber. Multi-angle and multi-wavelength optics differentiate combustible particles from dust particles. A blue LED is used for smoke detection, and an infrared laser source for dust to give unparalleled sensitivity. Multiple photodiode detectors pick up forward and backward scattering and, through complex algorithms, distinguish smoke from dust. This delivers unparalleled sensitivity combined with outstanding false alarm immunity. The experience we gained during the development of the COPTIR and PTIR multi-criteria point detectors has given us a significant background to develop sophisticated algorithms in this area. In the Strategic Operations sector such as datacenters and telecom facilities, integration of the fire alarm with the facility's management suite of programs is a fundamental requirement. FAAST has integral IP connectivity, enabling remote interrogation and monitoring using TCP/IP protocols. Alerts can be automatically broadcast to six different email addresses, a benefit unique to FAAST. FAAST contains inbuilt hardware to interface with the TCP/IP network. The IP capability runs in parallel with the normal comprehensive communications with the fire control panel, which enables extensive fault monitoring. The FAAST unit is a single-channel device with one inlet and one outlet pipe connection. Sampling pipes and electrical interconnects can be brought into the unit from either the top or the bottom. Eight Form C relays communicate alarm levels, urgent and minor faults, and isolate. 3A programmable latching and nonlatching relays are provided, and an event log tracks up to 18,000 events, including alarms, faults, and user actions, which can be accessed via PipeIQ software or the web interface. FAAST operates from an external 18-30VDC power source and draws an average operating current of 500mA @ nominal 24VDC. FAAST includes local displays covering the five alarm levels, 10 particulate levels, 10 airflow levels, and power, providing at-a-glance indication of the unit's status. An acclimate mode enables the FAAST device to automatically adapt to its environment within 24 hours, unlike competitive offerings that require up to 15 days to achieve the same objective. Pipe Network Coverage and EN54-20 VdS testing confirm FAAST coverage up to 2,000m2 with 4 x 100m pipes. EN54-20 is a mandated standard under the Construction Products Directive (CPD), which introduces a new classification system for aspiration systems, defining Class A, B, and C sensitivities. FAAST meets Class A, B, and C requirements. For applications where installing and maintaining point detectors is difficult or inappropriate, or to protect large open spaces such as warehouses, atria, stadia, churches, and railway stations. Another key area is where unobtrusive detection is required: in educational buildings, prisons, and heritage sites. 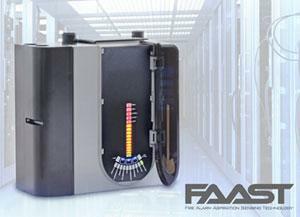 FAAST, and our general-purpose FAAST LT point detector in a box aspiration detector, meet Class C requirements for general fire detection in normal rooms with poor air quality or inaccessible spaces. The combination of discreet small-bore sampling pipes in the protected area and the remote detection unit provide an effective solution to system design and installation issues. Aspiration detection has advantages in buildings such as museums, churches, theaters, and mansions, where aesthetics are important. In areas where extremely hot or cold temperatures are to be expected, or where poor air quality is liable to cause point detectors to false alarm, an aspiration detector is an appropriate solution for providing cover. In large public areas such as shopping malls, stadiums, and concert halls, high ceilings mean that aspiration can often be the most effective protection technology, as it reduces false alarms, which can cause panic if large numbers of people are present. Why would specifiers adopt FAAST? Best in class coverage up to 2,000m2 per FAAST device reduces equipment costs. Flexible installation options with a wide choice of pipe lengths and hole spacings minimize waste. Easy installation, with well thought out cable access, reduces time and cost. Zero false alarm rate reduces emergency callout costs. Acclimate self-adjustment dynamically characterizes FAAST to the installed environment within 24 hours of installation. Sophisticated PipelQ design and monitoring software reduces system design time and cost. As we have demonstrated with all our recent product introductions, our mission is to develop technically advanced products that deliver demonstrable advantages to everyone who interacts with our products. FAAST not only achieves our objective of technology leadership in its class, but it has the additional benefit of extending our capability into the previously inaccessible high-sensitivity detection space. Datacenters are a key target sector; their construction is rapidly increasing throughout Europe, and we are extremely confident we can deliver the earliest warning fire systems to protect these mission-critical facilities. Visit the FAAST website here.